NAVITEL® released an updated map of Poland. The map adds new sections of motorways S5 and E67, opened on Christmas Day. The updated map of Poland contains 95 313 towns and settlements; 53 671 of them are settlements with address search support and detailed road network. The map includes 267 603 POI and 714 581 km of roads. Users can download the updated map of Poland for smartphones and tablets through Navitel Navigator application from the main menu of the app (My Navitel → Download maps). 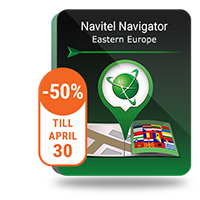 To update the map on GPS navigation devices based on Windows CE we recommend using Navitel Navigator Update Center.